The choice of which musical instrument can be sometimes a hard question to answer. By grouping the instruments into their orchestra sections, and providing some useful pointers the question might be an easier one to answer. Stringed instruments are produced in smaller sizes, and therefore can be handled by children as young as 5 or 6.Violins and Cellos both come in a variety of sizes. Guitars also come in junior sizes and can be played by children at about eight years of age. They are fairly cheap to buy and can be found on the high street for about £20 which means they are a popular beginners instrument. The recorder is a popular beginners instrument, and children can start playing it as soon as their fingers can reach the holes. They are cheap to buy and can be found for less than £10 on the high street. Another option if the child's fingers are small is to buy an Ocarina, a small round recorder with only 4 holes, which is much easier to use and handle by a child as young as 3 or 4. Their details can be found on the Ocarina website. Other woodwind instruments are best left until the child has there second set of teeth as pressure is put on the teeth as they are played. For this reason they don't tend to be made in smaller sizes and will cost a lot more than the recorder. By Secondary School age they should have strong enough teeth and be big enough to handle some of the woodwind instruments although a bassoon may still be too big. 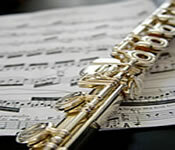 Children who may wish to learn the bassoon really should start on the oboe first as it is smaller, and easier to master the technique of blowing into a double-reed. The clarinet is sometimes used in the same way as a stepping stone to the saxophone. The brass instruments again do not come in smaller sizes, as they too exert a lot of pressure on the teeth whilst playing them. A child who has their second set of teeth is best off starting with a cornet or trumpet and then progress on once they are big enough to handle them. The trombone for instance needs a long reach to use it properly. The piano and the drums are popular instruments in this range. Although, if your child wishes to learn the piano, they do take up a lot of space and even a good second hand one can cost a lot of money. An alternative is a keyboard which can work out cheaper and possibly more fun for younger children. A junior set of drums could cost up to £200. One thing to remember is to get your child to try out the instrument first before you buy it. As it could prove costly. 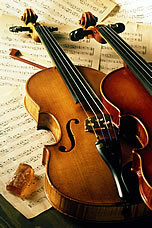 Information on the different types of instruments can be found in the Instrument Types section of our website.